Josh Gulbranson at Fraser Yachts sends news of the seventh price cut in two years, this time of $400,001, on his central listing, the 28.96m motor yacht Once Around. 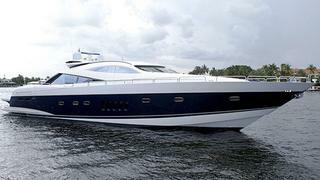 Built by Sunseeker in 2004, Once Around sleeps eight guests in a full beam master, VIP and two twin cabins, while twin 2,000hp MTU engines give her a cruising speed of 30 knots. She was refitted in 2009, including new teak decking and a hull paint job, and her engines had the MTU W-5 service. Previously priced at $2.4 million, Once Around is now asking $1,999,999.